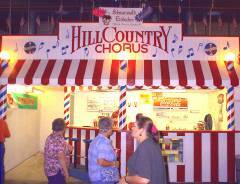 The Hill Country Chorus is a barbershop chorus located in New Braunfels, TX. We are members of the Barbershop Harmony Society. Our goal is to give men of all ages a chance to improve their singing skills, have fun, make new friends and provide service to the tri-county communities. We welcome all men who like to sing no matter what your skill level. We rehearse on Tuesday nights at 7:00 PM in the First Protestant Church choir room. The church is located at 172 W. Coll St, New Braunfels, TX. Click here for a map to the church. Enter the double glass doors on the Seguin Street side, turn right to the elevator or the stairway, go up to 2nd floor and turn left to the Choir room. August 4, 2018, 7:30 PM at the New Braunfels Bible Church. The church is located at 652 TX-337 Loop in New Braunfels. Come and enjoy the Hill Country Chorus perform a few of their favorite songs and listen to our featured quartet Sterling and Sweet Adelines chorus A Cappella Unlimited. Tickets are available at the door. Every year our members (and their wives) staff our Blackforest Ice cream booth during the 10 day Wurstfest celebration in New Braunfels. Come visit us. Part of our proceeds go to support the Big Brothers/Big Sisters program in Comal County.